Benefit of Blogging #1: Opportunity for Self-Reflection! Here at Pregnets, we want to make sure we are helping our users – including pregnant women, postpartum mothers, families and support networks, and health care providers – as best as we can. Since we wrapped up the Pregnets blog in July, we took some time to speak with 5 women about their experiences blogging for Pregnets. The following is the first in a series of blog posts highlighting some of the major lessons we learned from our conversations with our bloggers. June 30, 2015 November 2, 2015 Pregnets Team Pregnets Coordinator	blogger, pregnancy, Pregnets, quit smoking, Thank you! We are so proud of the incredible year we’ve had with the Pregnets blog! As the first phase of the blog wraps up, we wanted to express our gratitude for the incredible support we’ve received over the past year. We want to thank our bloggers, Deborah, Llew, Lucy, Melissa, Nathalie, Ruma, and Tracie, for sharing their heartfelt reflections with the Pregnets community. The Pregnets Team was thrilled to learn that the writing process helped our bloggers in their quit journeys and that they may continue to share their stories with Pregnets from time to time to update us on the new successes and challenges they face along the way. 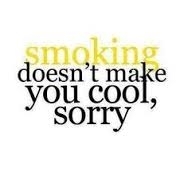 Smoking does NOT make you look cool. Although I seemed to think that it did when I initially began smoking.